Click on “Create new” button to add a new draw project, on My account or My projects page. If your draw has only one prize, put it into the first field. If you offer two same prizes (2x $10 voucher) use only one row and input the quantity=2. If you offer different prizes use several rows and add quantity to each prize. Optionally, you can upload an image to each prize – just select the prize and a new dialog appears on the right. Use JPG, GIF or PNG formats and the ideal image size is the square 250 x 250 pixels. All other dimensions will be resized to 250x250px. 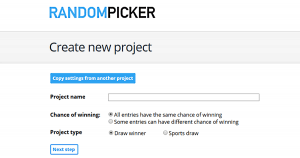 Do you repeat the same raffle every day/week/month on Random Picker? If yes, there is a way to automate this task making it much easier and faster to do! We’ve added a ‘copy’ function which allows you to quickly duplicate your raffle into a new one. How does it work? When you create a new project, click on the ‘Copy settings from another project’ button and then select the source raffle. The following properties will then be copied into your new raffle. Availability: The Copy function is available only in the paid plans (Basic, Standard, Advanced). See Pricing for further details.